Granite Hills’ Dillan Shrum is congratulated by teammates following his grand slam against Rancho Bernardo on Tuesday in the Lions Tournament. RANCHO BERNARDO – When it comes to selecting the East County Player of the Year, Granite Hills’ versatile senior DILLAN SHRUM is currently at the top of the list. Not surprising for the double threat pitcher-first baseman to put together an effort that carried Granite Hills to a 9-5 victory over Rancho Bernardo in Tuesday’s (Mar. 22) 66th Annual Lion’s Tournament Classic Division contest. This guy can do it all. Shrum was 2-for-4 with 5 RBI including a grand slam as the Eagles avenged an earlier loss to the No. 1 ranked Broncos. 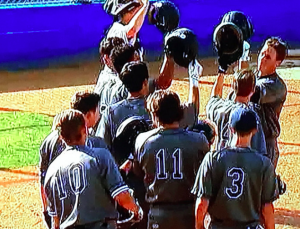 Granite Hills used a 7-run fourth inning to knock the Broncos on their heels. Shrum keyed the big inning with his 4th home run of the season. Sophomore left-hander WILL BURTON pitched a complete game victory for Granite Hills. CHRISTIAN 15, MADISON 4 – JUSTIN LEDGERWOOD slammed his 3rd home run and added 2 RBI to carry Christian to a lop-sided victory over archrival Madison in Tuesday’s (Mar. 22) 66th Annual Lions Tournament Premier Division game. The Patriots took advantage of 10 walks and 5 errors by the Warhawks to turn the game into a rout. KYLE STOWERS was 2-for-3 with a double and 2 RBI for Christian. CHASE WEHSENER, who is arguably the top defensive first baseman in the county, was 2-for-4 with an RBI for the Patriots. Arizona State-bound ZACH HOGUIESSON didn’t garner a hit but scored twice and drove in 2 runs. JOHN GERSHOW worked the first six innings to roll his record to 2-0. MOUNT MIGUEL 3, CHULA VISTA 2 – The Mount Miguel Matadors picked up their second win of the season on Tuesday afternoon (Mar. 22), knocking off the host Chula Vista Spartans, 3-2, in the 4A Division of the 66th Annual Lions Tournament. Junior ANDREW MONTIJO delivered the win for the Matadors (2-5), as he has now picked up the win in both Mount Miguel victories. TREVOR DARBY allowed only one hit in two shutout innings as the starter. Montijo picked up the ball to finish the job twirling the final five innings, allowing 4 hits, 2 unearned runs and 3 walks. He struck out 5. AUSTIN ORTIZ slashed a double for the Matadors and ANGEL ABARCA and JUAN SANDOVAL each stole a base. MIGUEL OROZCO had a sacrifice bunt. Sandoval went 2-for-3 with a run and an RBI. FOOTHILLS CHRISTIAN 11, CALIPATRIA 1 – KONNER VON DER LIETH pitched a complete game, allowing only 2 hits in six innings while striking out 11 as the Knights clipped Calipatria in Tuesday’s (Mar. 22) 66th Annual Lions Tournament 2A Division contest. After falling behind 1-0 in the first inning the Knights forged ahead on a tying RBI single by Von Der Lieth and a 2-run base hit by MARK PROFETA. In the fifth inning the key blow for Foothills Christian was an RBI triple by EZRA SIMS as the Knights extended their advantage to 5-1. Leading 6-1 entering the bottom of the sixth, Foothills Christian erupted for 5 tallies. Sims slashed a 2-run double to key the uprising. PALISADES 6, VALHALLA 2 – Valhalla Norsemen junior shortstop LEWIS DIRKES exemplified what teams look for in a leadoff hitter, reaching base three times, stealing three bases and scoring twice. However it was not enough to stop the Norsemen’s season long slump as they dropped a 66th Annual Lions Tournament Premier game to Palisades (LA City Section) at Eric Turgeon Field 6-2 on Tuesday (Mar. 22). Dirkes walked in the first adding singles in the fifth and seventh, scoring on a BROCK MOSIER double in the first and a CJ BROWN single in the seventh. They would be the only runs Valhalla (0-7) would muster. Palisades center field Remy Meteigner led the way for the Dolphins going 3-5 with three runs scored and a stolen base. After a first inning double, he scored on a fielder’s choice. He would score in the 5th via a wild pitch and in the 6th from a Harrison Hart sac fly. Taking the loss for the Norsemen was senior JARED TARDIFF who threw 5 innings striking out two and allowing 3 runs, 2 earned. The Norsemen seek their first win of the year tomorrow at Valhalla vs. El Camino at 3:30 pm. CALEXICO 3, MONTE VISTA 0 – JON GULLEY got the only hit for Monte Vista in the fifth inning on a clean single to center field in Tuesday’s (Mar. 22) 66th Annual Lions Tournament 4A Division game. The Monarchs had only four baserunners for the contest. In addition to Gulley’s liner, they had a walk and two hit batsmen, as Monte Vista had only one runner reach second. FRANK GUTIERREZ had a complete game for the Monarchs, allowing eight hits and two earned runs. Monte Vista committed four errors. Monte Vista fell to 3-4, while Calexico improved to 4-4. Calexico took the lead in the second on a run-scoring single. The Bulldogs added two in the fifth, including a double that plated a run. MIRA MESA 6, SANTANA 2 — The Sultans lost for just the second time in seven games in Tuesday’s (Mar. 22) 66th Annual Lions Tournament 5A Division contest. AIDAN RASMUSSON drove in a run in the fourth with a double, then singled home a run in the sixth. Santana’s DAULTON BARRY and BRANDON MOSBURG were touched for five earned runs. In the fourth, Nunez singled and Odenkirk singled, setting up a double by Rasmusson, plating Nunez. In the sixth, JERRY ALESI doubled and scored on the single by Rasmusson. Santana led early 1-0 until Mira Mesa scored four in the fifth and two in the sixth. Dominic Medina pitched a complete game to earn his second win of the season, while the Marauders’ Nathan Guyette went 2-for 3-at the plate. Mira Mesa is 4-2-1, while Santana is now 5-2. EL CAJON VALLEY 14, PALM VALLEY 7 –In the 66th Annual Lions Tournament 1A Division plus, the Braves’ offense looked strong against Palm Valley. Burton and Fenn. Marquez, Gallaher (4), Seamous (5) and O’Brien. Mitchell(RB) 3rd, solo; Williams (RB) 3rd, one on. Hirschberg, Weh (7) and Stewart. Tardiff, Applebaum (6) and Heider, ABrown (6). WP-Hirschberg. LP-Tardiff (0-1). HR-Hart (P) 5th, solo. Enright, Little (4), Henry (5), Lovato (6) and Rainaldi. Gershow, Gentry (7) and Josephson. WP-Gershow. LP-Enright. Darby, Montijo (3) and JSandoval. Rincon, Celiceo (7) and Garcia. WP-Montijo (2-1). LP-Rincon. Santana and Gilamadrid. FGutierrez and Matankino. Gonzalez, Hatfield (6) and Cervantes. Von Der Lieth and Link. WP-Von Der Lieth (1-1). LP-Gonzalez.